Central America is the central geographic region of the Americas. It connects the North American continent, with South America. This area, Central America is considered a subcontinent. 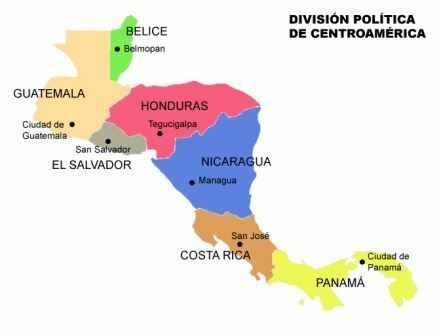 Central America consists of seven countries: Belize, Costa Rica, El Salvador, Guatemala, Honduras, Nicaragua, and Panama. Central America is part of the Mesoamerican biodiversity hotspot, which extends from northern Guatemala through central Panama. That is is a biogeographic region with a significant reservoir of biodiversity that is under threat from humans. It is bordered by Mexico to the north, the Caribbean Sea to the east, the North Pacific Ocean to the west, and Colombia to the south-east, which is also the most southern point of North America. Panoramic view of El Salvador’s capital city San Salvador. Click image for larger view. As of 2009, its population was estimated at 41,739,000. 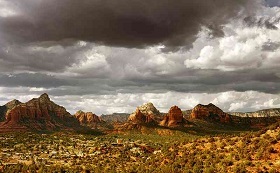 It has a density of 77 people per square kilometer which is quite low compared to other areas. Central America covers an area of 524,000 square kilometers or 202,000 sq mi. As a comparison that size is just slightly bigger than the state of California and Kentucky combined. Panoramic view of the increasing vertical development of the skyline of the city of San Jose, Costa Rica. Photo by Wikimaniac-CR, CC-SA-3.0. Click image for larger view. The Pacific Ocean lies to the southwest, the Caribbean Sea lies to the northeast, and the Gulf of Mexico lies to the north. Most of Central America rests atop the Caribbean Plate. The region is geologically active, with volcanic eruptions and earthquakes occurring frequently. The 1976 Guatemala earthquake killed 23,000 people. Managua, the capital of Nicaragua, was devastated by earthquakes in 1931 and 1972; the latter killed about 5,000 people. Three earthquakes have occurred recently in El Salvador: one in 1986, and two in 2001. An earthquake struck northern and central Costa Rica in 2009, killing at least 34 people. In Honduras, a powerful earthquake killed 7 people in 2009. Panoramic View of Tegucigalpa, Honduras. Click image for larger view. In the region volcanic eruptions are common. In 1968 the Arenal Volcano in Costa Rica erupted killing 87 people. The three villages of Tabacon, Pueblo Nuevo and San Luis were buried under pyroclastic flows and debris. Fertile soils from weathered volcanic lavas have made it possible to sustain dense populations in the agriculturally productive highland areas. Central America has many mountain ranges. The longest of the ranges are the Sierra Madre de Chiapas, the Cordillera Isabelia and the Cordillera de Talamanca. Between the mountain ranges lie fertile valleys that are suitable for the people. Most of the population of Honduras, Costa Rica and Guatemala live in valleys. The valleys are also suitable for producing coffee, beans, and other crops. 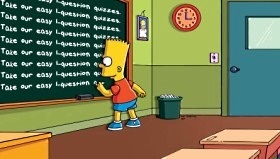 Read about Central America then take the easy quiz. Will you remember what you read? The Pan-American Highway runs through Central America, and except for a 54 mile rainforest break, called the Darien Gap. The road links the mainland nations of the Americas to a connected highway system. According to Guinness World Records, the Pan-American Highway is the world’s longest “motorable road”. However, because of the Darién Gap, it is not possible to cross between South America and Central America by traditional motor vehicle. The skyline of Panama City from Ancon Hill. Photo by Brian Gratwicke, CC-SA-2.0. Click image for larger view. What does Central America mean? Mexico, in whole or in part, is sometimes included, regardless of correctness, by Britons. Some geographers include the five states of Campeche, Chiapas, Tabasco, Quintana Roo, and Yucatan, together representing 12.1% of the country’s total area. 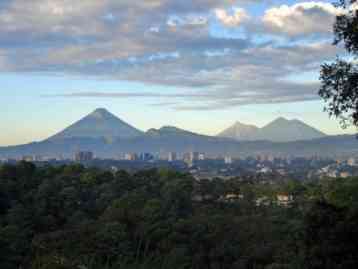 Guatemala City is the largest city in Central America with the “Agua”, “Fuego”, “Acatenango” volcanoes in the background. Click image for larger view. In Latin America, Iberia, and some other parts of Europe, the Americas are considered a single continent called America, and Central America is considered a distinct region of this continent and not a part of North America. In Ibero-America, the region is defined as seven nations – Belize, Guatemala, El Salvador, Honduras, Nicaragua, Costa Rica, and Panama – and may occasionally include Mexico’s southernmost region. Geopolitically, Mexico is considered part of North America. Occasionally, regardless of correctness, the term Central America is used synonymously with Middle America. Among some German geographers, Mittelamerika may be used to refer to the territories on the Central American isthmus. The UN geoscheme defines the region as all states of mainland North America south of the United States; conversely, the European Union excludes Belize and Mexico from its definition of the region. So as you can see there is somewhat of a quandary as to exactly what composes Central America. It can depend on where in the world one is located as to what their idea of Central America is. Although it looks fairly cut and dry when one looks at a map of Central America, it is all but that in reality. Take this quiz about Central America. This Travel Quiz is about Central America. There are 4 – 6 clues to help guess each answer. The level of this test is easy to medium difficulty. The cities mentioned in the article are potential cities you might want to visit. Consider each of these and other larger cities or area near one of these cities as a potential vacation destination. What country is Central America bordered by to the north? Mexico is the fifth largest country in the Americas by total area and the 13th largest independent nation in the world. It has an estimated population of over 113 million. It is the eleventh most populous and the most populous Spanish-speaking country in the world. It is the second most populous country in Latin America. The country is larger in area than all of Central America. Part of the border of the country is the Caribbean Sea. The country on the west is bordered by the Pacific Ocean. The national language of the country is not English. The country is in North America. Central America’s total population in July 2009 was estimated at? It is in the range of 8.7 million people. 20 million is about 1/4 of the population. The second and third hints both would indicate the approximate 41 million people. It is less than 170 million population. The population is somewhat more than 1/8 that of the United States, whose population was about 317.5 million in 2013. Twenty-one million is about half the population of Central America. Removing Belize’s population amount would reduce the total population of Central America by less than a half million. What is at the eastern border of Central America? The Caribbean Sea – It is a sea of the Atlantic Ocean located in the tropics of the Western hemisphere. It is bounded by Mexico and Central America to the west and southwest. It is not the Pacific Ocean. It is a body of water larger than a lake. Bellingshausen Sea is difficult to pronounce so it is very unlikely. A strong guess is it is probably a sea of some sort. Which country is not in Central America? Colombia – It is located in northwestern South America, bordered to the northwest by Panama and to the north by the Caribbean Sea. Belize sounds like it might be it, but this is not it. This country sounds like a candidate, but you can count out El Salvador. Drugs are a popular product from this country and a lot of deaths and problems are caused by it. The drug problem in Mexico is bad, but Mexico isn’t on the answer list. What city in Central America has the most populated metropolitan area? Guatemala City – it is the capital and largest city of the Republic of Guatemala, and the most populous in Central America. It was on one of the charts in the article. Belize City is not large enough so you can forget this city. Tegucigalpa Honduras has about half the population of the biggest metropolitan population area. San Salvador is definitely in the running for 2nd place. San Jose, Costa Rica sounds like it might be it, but it has the smallest metro population. If your passion is to travel, then you may not miss this short video about the top 10 destinations in Central America. TWILA’s Mike Danna concludes our Central American Profile series with ecotourism in Costa Rica. The LSU AgLeadership Class XIII experienced the rainforests on the Arenal Hanging Bridges and learned how protective Costa Ricans are of their rainforests. A revamp of Belize Tourism Board’s(BTB) “Be One With Belize” video. Special Thanks to Minister of Tourism, Hon. Manuel Heredia Jr. for allowing us to borrow some clips in an effort to market Belize and all its natural, wonder to the world.